I knew that I wanted to do this exact post today before today even began. I can’t tell you where I got the notion it wanted to be written, but somewhere. I can only presume, the universe decided long before the idea even came to me. Dreams are an interesting topic. 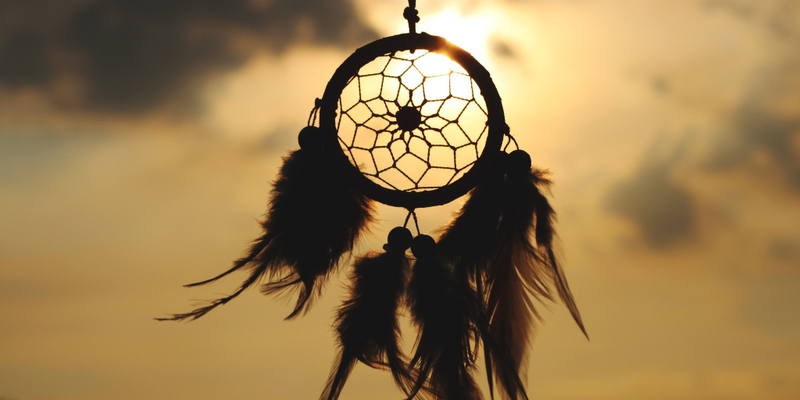 There are numerous websites exploring the meaning of dreams – the kind we have while we sleep. Then, of course, there are our daydreams. The ones we have as we stare off into space thinking of things bigger than ourselves and wanting to be bigger. And there are the concrete ones we have that we encase with goals and visions to make them real. I don’t know where dreams begin and end. I know when one becomes real it means something has started and waiting has finished. Remember when I wrote within every ending the beginning is already there? There’s a tree in South Carolina of which I made the acquaintance last spring. 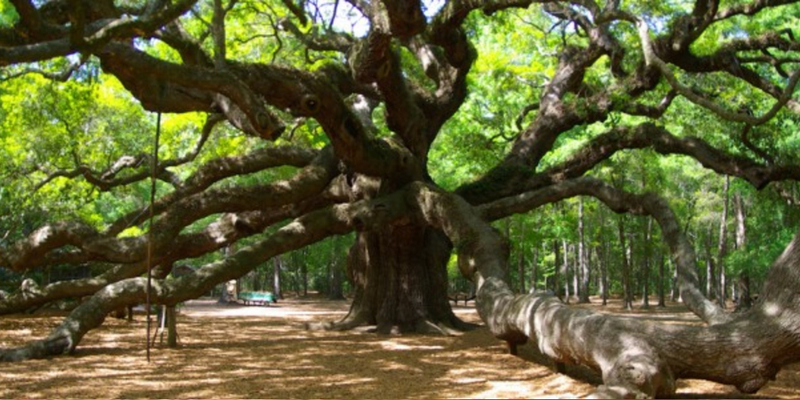 It’s called Angel Oak. 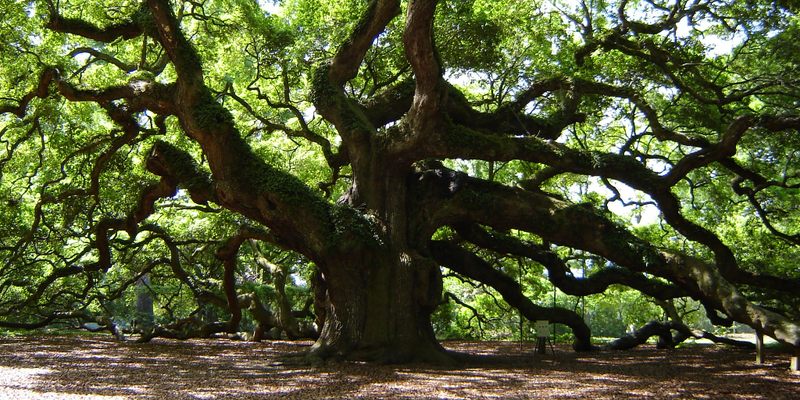 Angel Oak is estimated to be about 1500 years old. People come from all over the world to say prayers, meditate, photograph, paint, and “just be.” I was mesmerized by its expansiveness. I leaned on the ginormous branches. Visitors are not allowed to climb the tree or its limbs, but the tree commands such respect just by its presence, I don’t know why anyone would do anything that might harm it. Cables hold the tree together, and the limbs travel through the ground and then rise again on the outside of the earth. I could have stayed with it forever. So when the idea came to write about dreams, I thought about that tree. Estimation is that the seed is from the time of Noah’s Ark and traveled during the flood; eventually settling and taking root. A seed is an excellent example of a dream because it is so tiny and initially has nothing but a desire to make it think it will grow into anything but what it is. But magic happens. The seed comes into contact with just the right elements, and it’s given the opportunity to be more. That tiny seed was already the beginning of something big. We have seen plants come pushing up through cracks in sidewalks. In the tiniest spots on the side of a rock, we find seedlings holding on to faith that there is a chance to be big. People we thought would not make it through a disease, push through and continue to live vibrant lives. How many times have we heard stories of the unbelievable? Migrants plant their seeds and become rooted well enough that they become entrepreneurs, designing things that change our lives. Dreams can seem too big and impossible. Especially if an idea planted takes a long time to grow. We are deserving of happiness, health, and love. However, we don’t get assigned lives that are without bumps and delays. When these times happen, it’s up to us to keep them in perspective. Bring life back into balance. If you are fearful, let go of fears. And search them out. Sometimes we think we are fearless when really, they have been driven deep within to be forgotten. Choose hope. Remember hope is faith in action and dreams need faith. I don’t know when to decide when we are to let go of dreams. Are we ever supposed to let go? Or is it possible to keep them alive in a different way than staying focused on them? The latter is what I think. I think there are dreams that we have which require us not to let go of them but to let go of trying to control them. Work on other areas of our lives and allow the dreams to come through the floods and take root. Forgive yourself. Whatever it is that is holding you back, forgive and let go. Ask for what you want. Do what you can and what is needed. Have clear communication with yourself, with God, and with whomever else is involved. State intentions clearly to avoid misunderstandings. If it needs time, write your dream down and then put it away. Be intentional and ask for what you need to achieve your dream. Let it go. Allow for the magic to happen. Don’t be afraid of realizing your dreams. Open your heart to receiving. Dreams help build us. They are visions of where we wish to be. For them to come to fruition, life must be experienced. Don’t allow fear to stop your dreams from becoming reality. Disappointments happen. Don’t let them deprive you of joy.